As the name suggests, this is the type of bet you go for when you really want to try your luck. Here, you simply put your chip (the plastic coin with a certain value) on any number on the board. The payout is 35 to 1, meaning that you will get 35 times your stake if you are lucky enough to guess right. By placing your chip on the middle between any two numbers, you are betting on one of these two to show up during the next spin of the wheel. Since the chance of winning is doubled, the payout is halved. Hit it right, and you will see your money come back to you. If you put your playing chip on the horizontal lines next to each row of three numbers, you are betting on these three. Quite logic, isn’t it? Here, your chances of winning are three times higher than if you bet on a single number. Hence, the payout is 11 to 1, meaning 11 times your money back if you win. Fours numbers in a block, from 1-5, 6-11 etc., further increasing your chance of winning and hence lowering the prizes. Since you statistically will win one in 5-6 rounds with these bets, your stake will come back to you 8 to 1. As the name suggests, you are here placing your funds on six numbers in a horizontal row. Again, the chances of winning are growing and the payouts are becoming smaller. Guess correctly, and get your money back 5 to 1. If you divide the board into three columns, your chances of winning are drastically improved. Statistically speaking, one of three rounds will hit one of your numbers. Again, the payout is lessened by mathematical calculations, and prizes are 2 to 1, meaning you will get 2 euros in prize in addition to the 1 euro you originally staked. Just like above, you are here dividing the board into three equal parts, and betting one of these three. Hence, there is a slightly more than 30% chance of winning, and the payout is exactly as mentioned above – 2 to 1. By placing your chip on the designated Odd/Even areas outside of the main board, you are guessing that the next number to be chosen by the little ball in the roulette wheel will be either Odd or Even. Since there is a 50/50 chance of winning, the potential prize is simply double what you staked. 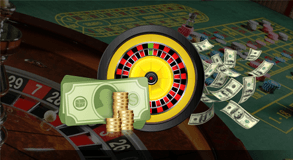 These are among the most common bets, since you will statistically win every second round, and could hence come out on top if using one of the most common roulette systems. Bet 1 euro, and get 2 euros back if you win. Double or nothing, easy as that. This is probably the most common bet out there, and most new players will stick to red or black bets when they start their casino career. At the same time, red or black bets are the favourites of those who are trying out the most popular strategies (Martingale, D´Alembert, Labouchére). Since the chance of winning is again 50/50, you will either lose your stake or double your funds. Plenty of stories and legends are going around in regards to these bets. Some people sell their houses and take all their money out of their bank accounts, simply to try their luck once on the red/black bet and either double their worth or lose it all. At the same time, there are stories that tell of people going bankrupt when one the colours came up a dozen times consecutively. Seeing black coming up five times in a row, most people think that red should be next – statistically speaking. Roulette is a game of chance, though, and there is one particularly famous story which claims that red came up 26 times in a row once, in Monte Carlo. Be careful, and keep cool! Just like the two above, halves divide the table into two and hence pay out double or nothing. Bet either on the first 18 numbers, or on the last ones. Be aware though that the zero will show up from time to time, and most players lose their money this way, while the casino cashes in huge amounts.